FTS launches new precise and reliable H-Series Quick Deploy portable weather stations for the hydrological and meteorological markets - FTS Inc.
FTS is pleased to announce that we have expanded our product offering to include our H-Series Quick Deploy (QD), specifically for our hydrological and meteorological markets. The H-Series QD supports both our H1RS and H2 Axiom Dataloggers, a number of telemetry options and has been CE certified for sale outside North America. All our QD’s are also compatible with any member of the Lufft WS sensor family, including the Ventus. With a dedicated mount, the QD station can be assembled and pre-configured with your choice of Lufft WS sensor ready to go out of the flight case. 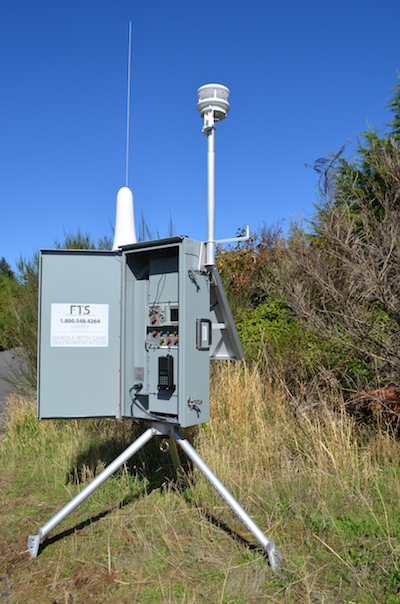 With a network of over 2,200 fixed fire weather stations throughout North America, FTS has been providing data through reliable telemetry for over 20 years. The data is used to predict, prevent, and coordinate suppression activities before and during extreme events. Because fixed stations are not always in the location you need them when an event breaks out, FTS developed the Quick Deploy (QD); a portable remote automated weather station that offers the same precision and reliability as our fixed stations for our fire weather market. The QD can be quickly deployed and re-deployed into the area of interest to measure precise micro-climate changes critical for monitoring high risk areas where extreme events are suspected to or may have already have begun. The QD offers secure deployment using a telescoping tripod system that allows feet placement on uneven terrain and can withstand wind gusts of up to 160km/h (100mph). Its built-in intelligent power management system monitors solar panel output, optimizes charging voltage based on temperature and can even throttle telemetry communications, while always recording data locally. The QD packs into two supplied flight cases, weighing 35kg (75lbs) each and can fit in any regular vehicle, ATV or helicopter. There are currently over 50 QD’s in active duty right now. Watch our video to see our Quick Deploy for Fire Weather in action. Contact us to find out more about how our H-Series Quick Deploy Portable Weather Stations can help your organization quickly and reliably monitor and measure critical event breakouts, or visit our website for complete details. FTS Launches New WebsiteWhat is El Nino and How Does it Impact the Environment?